Meanwhile, Fine Gael remains a single point ahead of rival party Fianna Fáil, according to the latest poll. 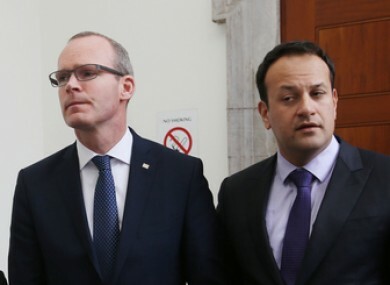 MINISTER LEO VARADKAR remains ahead of his party rival Simon Coveney in the race to become the next leader of Fine Gael, according to the latest opinion poll. The Sunday Times Behaviour and Attitudes poll puts support for Social Protection Minister Leo Varadkar at 25%. Rival Simon Coveney is one point behind on 24%. Minister for Housing, Planning, Community and Local Government Simon Coveney has bounded ahead of Varadkar with Fine Gael supporters, however. Support for him among likely Fine Gael voters is up two points to 33%. Meanwhile, support for Varadkar among this cohort is down six points to 28%. Speculation about when current Fine Gael leader and Taoiseach Enda Kenny will step down. Kenny has been closely guarding his planned departure date, deflecting questions on the issue for the past few months. Either Coveney or Varadkar are well ahead to take his position, but Education Minister Richard Bruton and Justice Minister Frances Fitzgerald are also in the mix. Support for Bruton is up four points to 9%; while Fitzgerald is unchanged on 5%. Meanwhile, Fine Gael remains a single point ahead of rival party Fianna Fáil, according to the poll. The party is at a 28% approval rate, down 1% since the last survey. Fianna Fáil is at 27%, also down one point. There is a 3.5% margin of error in the poll. In general, the parties are on much of the same footing as the last poll. Sinn Fein remains unchanged on 18%, while Labour is down one point to 4%. Email “Leo still ahead in leadership race, but Fine Gael supporters leaning towards Simon”. Feedback on “Leo still ahead in leadership race, but Fine Gael supporters leaning towards Simon”.